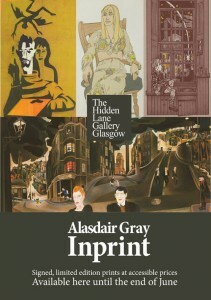 The Hidden Lane Gallery were pleased to offer throughout Summer 2017 a collection of some of Alasdair Gray’s striking images in Giclée print form. The principal motivation came from a request by Alasdair to make his works more affordable, to share them with more people. The show consisted of twenty-one images (two differing colour versions of the delightful ‘Little Indian’ portrait of Alasdair’s son Andrew as a young boy) and ranged from the superb ‘The Card Players’, created by the artist when he was still at school – aged sixteen in fact, to the almost psychedelic colour abstracts which he has been working on in the past few years. Prices in the catalogue are for unframed prints available in the gallery. 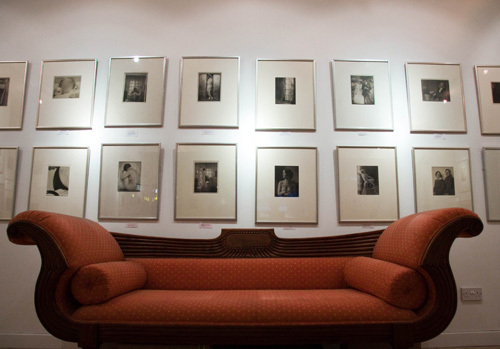 Many of the prints are still available at the Gallery despite the show being closed. Tuesday to Saturday 11a.m to 5 p.m.